Just 3 minutes walk from Hotel Loggiato dei Serviti and you can reach and visit a unique museum in Florence: the Leonardo da Vinci Museum, in Via dei Servi 66, entirely dedicated to the genius of Leonardo. Leonardo was not only one of the greatest artists of the Renaissance, but he was an incredible inventor, still regarded today as a precursor of modern times. 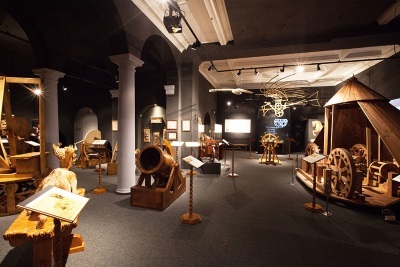 Inside the museum there are many reproductions of Leonardo's inventions. Machinery, weapons, wall and table clocks, paddle boats, irrigation systems: some inventions can be tested and put into operation directly by the visitors. Inside the museum there are also the Anatomy Room (dedicated to Leonardo's studies on the human body) and the Room of Paintings (multimedia trip obviously dedicated to the history of Leonardo's most famous paintings and frescoes). "Scientist before science existed", "technician before technology existed", as well as one of the greatest painters ever: these phrases are enough to recommend to all our guests a visit to the Leonardo da Vinci Museum.